I’m always looking for new ways to cook chicken, especially recipes that are quick to make. Nolan loves chicken stir fry, so I make that pretty frequently with a basic recipe, adding or subtracting depending on what veggies and flavorings I’ve got on hand. But variety is the spice of life, so here are three stir fry variations we’ve tried out recently. First up is a chicken satay stir fry with a peanut butter based sauce meant to emulate the dipping sauce used for satays. I don’t really care for peanut sauce, but Jeremy does, and we had most of the ingredients on hand, so I thought it was worth giving it a shot. This recipe was alright, although the peanut butter still gives the sauce a little strange texture for me; at least it wasn’t spicy. I did have to use orange juice from concentrate, and dried zest in the rice. I also substituted broccoli for the snow peas. Next up is a recipe that looks remarkably similar, but tasted completely different. 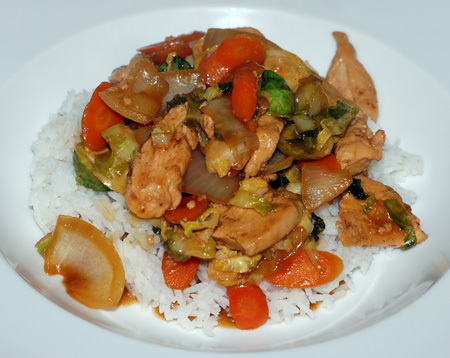 It was based on a Real Simple recipe that seemed to be a cross between a soup and a stir fry, based on all the liquid and the direction to simmer the chicken and veggies in it. For me, the Brussels sprouts were what really set the recipe apart, but a liquidy sauce didn’t appeal to me, so I made some adjustments. 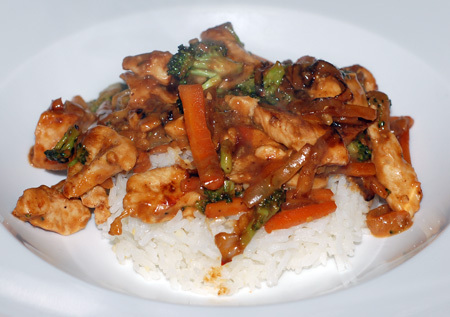 Toss chicken with 5-spice and saute in a hot wok or skillet with a little oil, until opaque. Add the onion, carrot and Brussels sprouts, then add ginger and garlic, and saute just until fragrant. Then add the rice vinegar, soy sauce, brown sugar and chicken broth, and simmer until broth has reduced slightly and vegetables are tender-crisp. Add cornstarch slurry, and continue to simmer until sauce has thickened. Serve over rice. This recipe is in some ways similar to the last. 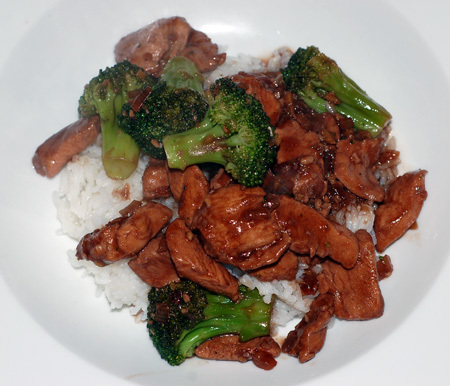 I adapted this recipe because Jeremy just wanted something like teriyaki and broccoli, and I wanted to incorporate the sweetness of some fruit juice into it. Usually I’d reach for orange juice, but we were out, so instead I used some of the big bottle of pomegranate-blueberry juice we’ve been making into smoothies. It actually came out pretty well, and may be worth repeating, with the ginger toned down a bit (it was pretty strong!). Heat the oil in a large, heavy skillet over medium-high heat. Add the sugar and stir, using a wooden spoon, until sugar darkens just slightly. Toss the chicken pieces with the 5-spice, add to the skillet and stir well to coat. Cook chicken for a few minutes until the outside of the chicken pieces turn opaque. Add the shallots, garlic, ginger, and orange zest; cook, stirring, for a few minutes until shallots and garlic have softened a bit. Add the soy sauce, rice wine vinegar, and juice. Bring to a simmer and allow to cook until the chicken is cooked through and the sauce is slightly reduced. Add cornstarch slurry, and continue to simmer until sauce has thickened. Toss with broccoli and serve over rice. Source: Adapted heavily from eHow.